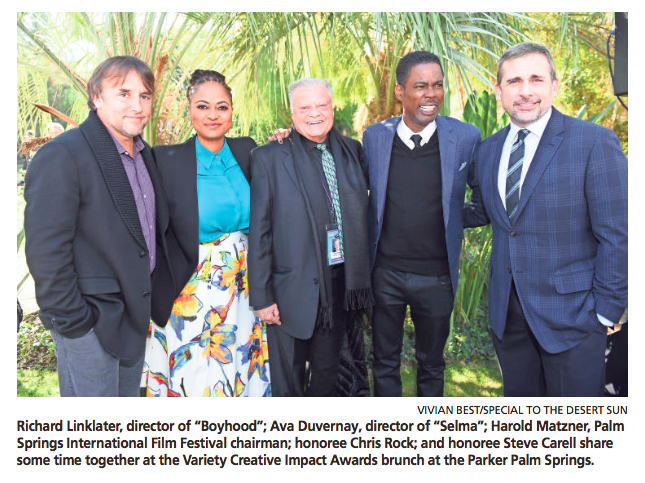 It was a stellar day for the elite crowd of Hollywood royalty attending the Variety Creative Impact Awards brunch held at the stylish but quirky Parker Palm Springs. Day three of the Palm Springs International Film Festival was buzzing with luxury cars and limos cued up in front of the imposing white mid-century resort. I was leaning against a wall by the entrance waiting for my husband when an oversized SUV pulled up a few feet away. The door opened and out jumped “Boyhood” actor Chris Rock, who was there to receive the Creative Impact in Comedy Award. Flashing a warm smile, he stopped, put his hand on my arm and said with a twinkle in his eye, “you are doing a stand-up job there.” A bit taken aback, I thought to myself that the chance encounter was an interesting start to this special Palm Springs International Film Festival event — described by one attendee as the hottest ticket in town. In a secluded area of the Parker’s lush central gardens was a giant step-and-repeat screen along with a hoard of paparazzi armed and ready for celebrity arrivals. The sun was as bright and warm as guests strolled down a pathway leading to a cordoned off outdoor venue with white tables, food stations, and a stage. Security was tight. On-the-alert types with dark glasses and walkie- talkies peppered the grounds. This was people-watching at its best. The lovely “Still Alice” actress and film fest honoree Julianne Moore was there to present the Creative Impact in Acting Award to “Foxcatcher” actor Steve Carell. She looked bandbox perfect in a simple, but elegant, sleeveless black Alexander McQueen Resort dress and was gracious to everyone who approached her. “Gone Girl” actress Rosamund Pike, Grace Kelly elegant in a Proenza Schouler black knit crew-neck top and black and white hand-painted pleated skirt, presented the Creative Impact in Directing Award to popular “Into the Woods” director Rob Marshall. Chris Rock, “GQ” perfect in a shirt, tie, V-neck sweater and blue blazer, received his award from “Boyhood” director Richard Linklater. During his acceptance speech, Rock appealed to the audience to please vote for him to receive an Academy Award. “It’s my mother’s 70th birthday, if I am nominated, I will take her to the Oscars. If not, I will take her to Fat Burger. We don’t need another black woman at Fat Burger. Please vote for me.” A roar of laughter could be heard across the Coachella Valley. Robert Duvall, being his own man and celebrating his 84th birthday, casually donned a baseball cap and a down vest looking ever so much the star that he is. Duvall, the night before at the sold out film festival gala, had received the Icon Award for his life- time of movie accomplishments. Ava DuVernay, who was honored as one of Variety’s 10 directors to watch, received many compliments regarding her playful ensemble that included a turquoise blouse, black blazer and bright floral print full skirt. DuVernay’s widely acclaimed film “Selma” opened the film fest festivities. The gathering of local VIPs and celebrities, along with the Hollywood crowd, sported jeans, leggings, blazers, sweaters, leather jackets, fun-furs, up-to-there mini dresses. Philanthropist Helene Galen was her usual classy self in comfortable slacks and a beautiful dove-gray jacket and matching neck scarf. Crooner Jack Jones was seen with his gorgeous wife, Eleonora, dolled up in her “Doctor Zhivago”-styled gray fur hat and white fur jacket. Then there was the dapper festival chairman Harold Matzner, clad in his “man in charge” black shirt and sports coat accented with a colorful patterned teal tie and his signature white sneakers and hanging out with Steve Carell and Eddie Redmayne. Former professional football defensive back and actor Fred (The Hammer) Williamson made a crowd-pleasing touchdown with his confident “Hollywood persona” while sporting a black leather jacket. Variety’s Vice President and Executive Editor Steve Gaydos, an award-winning screen- writer, kicked off the ceremonies by welcoming the audience and thanking those involved in the partnership be- tween Variety and Palm Springs International Film Festival. He introduced his Variety team, including publisher Michelle Sobrino, the first woman to head the 110-year-old Variety mag- azine. He rattled off the current top films and touted the film festival for discovering new film makers each year; as well as applauding the successful collaboration between the festival and Variety. 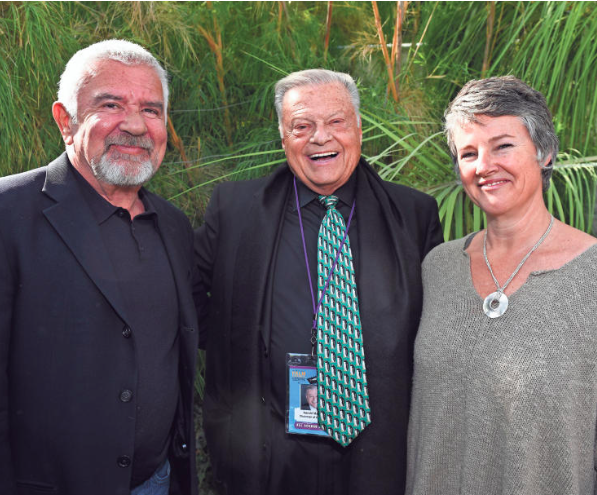 Executive director Darryl Macdonald with festival chairman Harold Matzner and artistic director Helen du Toit. “Since the dawn of motion pictures this art form has been fueled by pioneering voices who push the boundary of storytelling with innovative documentary structure and new technologies,” said festival director Darryl Macdonald. “The PSIFF has always been dedicated in celebrating those new voices and new visions emerging in film world- wide. It is appropriate that we join with Variety in celebration of both new talent and the pioneering voices we are here to honor. Festival artistic director Helen du Toit introduced the winning directors, narrowed down to 10 from hundreds of filmmakers: Sean Baker, Justin Benson and Aaron Moorhead, Ava Duvernay, Shlomi Elkabetz and Ronit Elkabetz, Jeremy Garelick, Dan Gilroy, Marielle Heller, Ruben Ostlund, Damian Szifron and Leigh Whannell. Guest Jamie Kabler, who was there with philanthropist Helene Galen praised the event, saying, “Variety always highlights the directors and stars who, in the next year, will get the attention. It was amazing to meet the director of “Nightcrawler,” as well as the directors of “Gett” — one of the best Israeli films of the year.” Also present were Carolyn and Daniel Caldwell, Kaye Ballard, Dale and Leslie Chihuly (designer of the festival’s awards), Melissa, Tristan and Reid Milanovich, Sidney Craig, Colleen Haggerty, Sean David, Ann Greer, Dori and Charles Mostov, Michelle Quisenberry, and Mary Ann Labahn and Peter Mahler. Much of the buzz among guests was the fact that next year’s festival will kick off with an opulent New Year’s Eve party and the opening film will be shown Jan. 1, followed by the grand gala on Saturday, Jan. 2, 2016.